Jammu, February 12, (Scoop News)- Saying that people of the State have been the worst victims of continued violence and uncertainty, Chief Minister, Mehbooba Mufti today said that dialogue is the best way to resolve issues and end this acrimonious situation. Speaking separately in the two Houses of the State Legislature on the last day of the Budget session, the Chief Minister said the people of Jammu & Kashmir have been caught in the web of violence for the past 30 years or so and it was out of this pain and suffering that they have been demanding dialogue and better relations between India and Pakistan. “For how long shall the people continue to die and for how long shall we be laying wreaths?”, she said in an emotional tone adding that not wars but the reach outs hold the key to peace and friendship. Referring to recent attack on Sunjwan Army camp and continued shelling on the borders in the State, Mehbooba Mufti said violence and wars in the past have only led to miseries to people and it is the earnest desire of the people of the State to see an end to this so that they can live in an atmosphere of peace and amity. The Chief Minister regretted that some television channels are creating an unnecessary acrimony about the State for increasing their TRPs. “This way they are alienating more the people of the State from the national mainstream”, she said while appealing media to play a positive and constructive role while reporting and discussing developments about the State. Terming the Legislature as the forum to raise and redress the problems of people, Mehbooba Mufti said opposition has a role to put Government on toes to deliver. She said democracy and dissent are the biggest strengths of the country the reflection of which is being witnessed in the two Houses of the State Legislature. She said it would be a tribute to the people that maximum issues of public importance are raised in the Legislature for redressal. 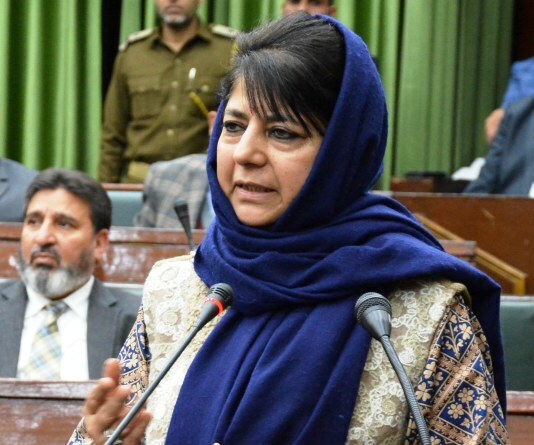 Mehbooba Mufti praised the Presiding Officers of the two Houses, Chairman, Haji Anayat Ali; Speaker, Kavinder Gupta and Deputy Speaker, Nazir Gurezi for the patience and manner in which they conducted the proceedings of the two Houses. She also praised the members of the two Houses for raising the issues of public importance during the session. The Chief Minister also had a word of praise for the staff of both the Houses and all the related Departments for their dedication to make the session a success.